In my quest to study the journals of successful people, Benjamin Franklin has not only been near the top of my list but also has been most request by many of you who kindly write to me. Franklin has intrigued me due to his self-made success, start starting from humble beginnings and rising to become a successful printer, writer, musician, inventor, and, of course, Founding Father of United States. Many, including myself, are aware of Franklin’s life accomplishments. But I wondered what processes he followed that eventually resulting in his accomplishments. 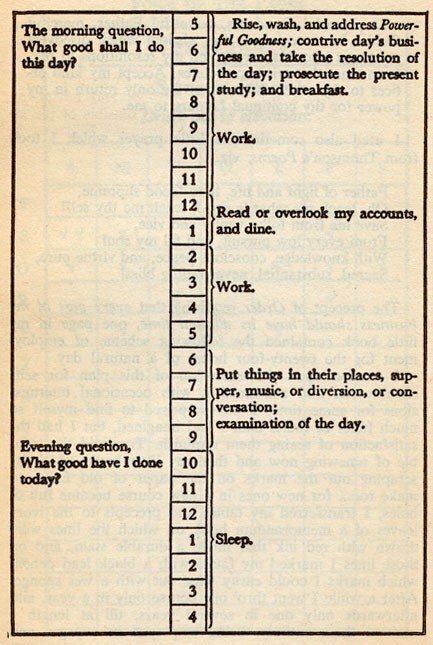 To answer that question, I dug into Franklin’s journals and writings and found timeless tips that I then experiment with on myself. 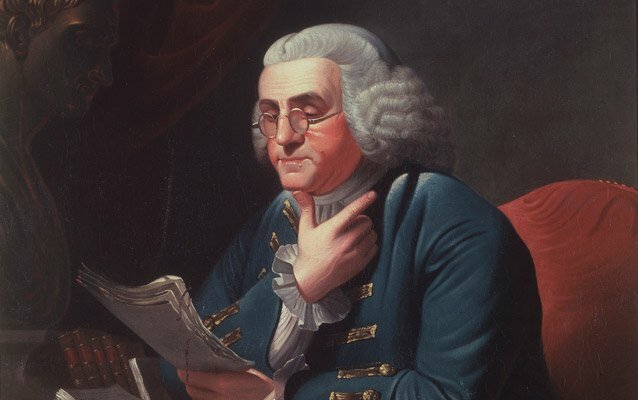 Curiosity drove Franklin to try vegetarianism and write about philosophy, politics, morals, and self-improvement — all despite dropping out of school at age 10. Writing is how Franklin seized his curiosity and made it tangible not only for himself but also for others. But wait, how did he learn to write if he dropped out of school at age 10? Franklin’s curiosity led him to teach himself. With that formula in mind, we can now dig into the specific tools and techniques that Franklin articulated while using it. By his early 20s, Franklin had already failed in business twice and was raising a son born outside his marriage. 10. CLEANLINESS. Tolerate no uncleanliness in body, cloths, or habitation. Not everyone has the same goals as Franklin, and neither did I, so I articulated my own virtues (or goals) and followed these fundamental lessons learned from his process. Singular Focus: If you have a lofty goal, break it down into smaller chunks, and focus on each chunk at a time. Track Progress and Reflect: Changing habits take time. Rewire and condition yourself by recording your progress and reflecting. Repetition: Repeat until it becomes a habit for which you don’t have to exercise much effort. Accountability: Franklin shared and consulted with a friend, which must have allowed him to develop accountability — not to mention that he was writing his autobiography, in which he wanted to present his best self. Clarity: Instead of just setting the goal of achieving “sincerity,” Franklin further defined it with a sentence — “Use no hurtful deceit; think innocently and justly, and, if you speak, speak accordingly” — so his mind would have the clarity to focus. 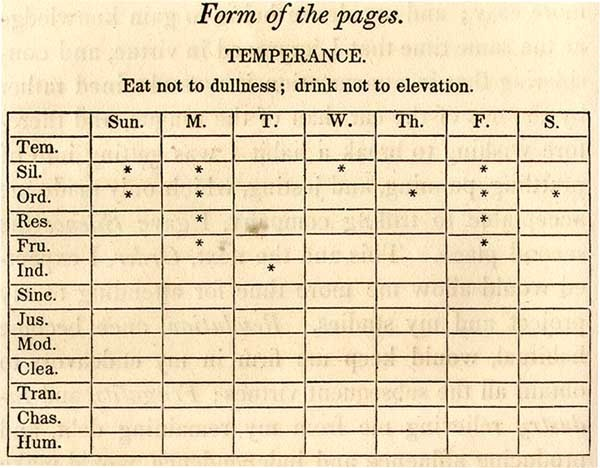 At first glance, sticking to a rigid schedule may sound counter-intuitive to people whose lifestyle (family or otherwise) won’t allow it, but the lessons learned from Franklin’s schedule are more important than the rigidity of his schedule itself. Work in Compartments: Work takes over the time it is allowed; thus, constrain yourself for focus and productivity. Track Your Time: You can’t improve what you don’t track. Organize Your Time and Day: This help you focus on doing the work instead of thinking and managing it . Reflect on Your Day: Ask yourself those two simple questions mentioned above. Keep a Journal: Like Franklin, keep a journal so you can apply the simple formula of writing and curiosity in your life. Example of a decision I made in my journal using Franklin’s method. As fundamental and simple as it sounds, most of us struggle with good decision-making, which is a fine art of decisive, quick, and educated guesses. I didn’t realize how stress-free decision-making can be — from ending a relationship to shutting down my company — with Franklin’s decision-making method. Write It Out: Don’t use your brain as a storage device where you keep looping over the same details; rather, use it as a decision-making tool. Weigh Your Options: Weigh each of your options so you can eliminate them against the pros or cons. Focus on Articulation Before Making a Decision: Clearly write out your decision, including the pros and cons, so you can clearly make a decision. It is worth appreciating that not only have some people brought scrutinyto Franklin’s ideas on self-improvement, but many of us also lack the freedom to worry about the higher levels of self-improvement on Maslow’s hierarchy of needs. After all, Franklin had a dedicated housewife to take care of his children, a sister to help with household chores, and even a handful of slaves. Thus, one could argue that he had the lower levels of Maslow’s hierarchy provided for him, which then gave him the personal and economic space to reflect and develop higher-up values of virtues. My take on that — as well as other arguments against why we can’t be like our heroes — is that it’s about the journey of self-improvement and not the destination. Franklin may have arrived at an economically and socially privileged position later in his life, but it’s important to keep in mind that his journey started humbly and ended with him yearning for more — that alone is enough for each of us to be forever growing through life. A wonderful history with lessons for life and how to take proper steps to achieving the goals and attributes of our higher self. A blessing to have Ben Franklin as one of our nation’s Founding Fathers!